Discussion in 'Fan Art' started by Babs Gordon, Feb 22, 2005. OK so here are some of my drawings that I do in my spare time. Nightwing and batgirl. I'm not really certain where the inspiration for this came from. It's a pretty dark, somber image though. well i scanned this one a little crooked... and its no hero in particular. i did this during the comic book class i teach at work and the kids thought her face looked just like mine. must be some weird subconscious thing i do. i love her suit the best. if i were a superhero my suit would be just like that. Excellent, looks like Nightwing is giving Babs his old "escrima stick". thanks. i should keep a running tally of how many guys think something dirty about that first one. right now its about 5 different guys. it's really meant to be kind of a sad picture. Not bad, can't wait to see some more. i'm doing my first batman one ever right now. it's also my first attempt at a figure running ever so bear with me. i had to use Hush as a figure guide so i don't fu¢k it up too badly. moving on to superman. will post tomorrow. comic book class i teach at work and the kids thought her face looked just like mine. must be some weird subconscious thing i do. i love her suit the best. if i were a superhero my suit would be just like that. I really like the above image. It reminds me of another picture of seen somewhere. Good stuff. I didn't know you teach comic book class at work. Where do you work? What do you do? I'll make it easy for you Babs all guys immediately thought something dirty about that first one. There great, and that Nightwing Batgirl picture, could the inspiration come from a Crow book? the batman one up above and this one are quick sketches i did in about 15 minutes each. as you can see batman was inspired by jim lee... i've never drawn a figure running before so i had to look on to see how the geometrics of the body were. 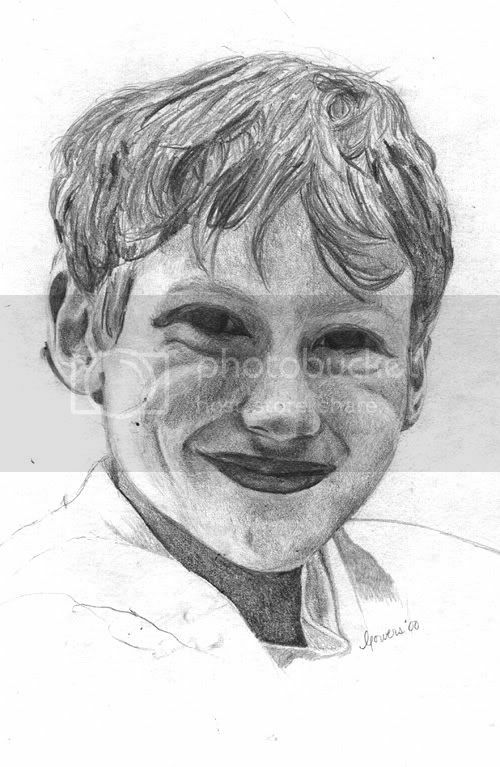 and lastly here's a portrait i did back in 2000 that i spent a whole lot of time on. it's my cousin but it *could* be a young bruce wayne, right? Portraits are very difficult to nail right, because you know what the person has to look like, there's no room for a hell of a lot of flaws. I tried making one of my girlfriend, everybody likes it but me. anyway. here's another quick sketch i did. this time batgirl and supergirl... no shading though. thanks zer00! that's one of my favorites too. i started out with the girl... then i added the guy and i was like "hey-- that looks like nightwing and babs!" so i draw some stripes on his suit. i like the emotion in it best. it seems very tragic to me. i like the emotion in it best. it seems very tragic to me. Yeah same here. I also like that fact that it's very dark. i've simply got to post this over here. "zedin" from BTN's the planet did some color and 'ink' over my batman drawing and i'm simply in awe! this time i rendered it myself... just to try it out. i'm obviously not very good... but i had to try!